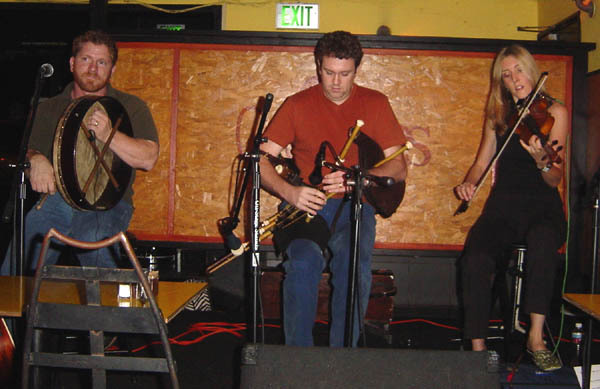 An Rógaire Dubh - third tune in a set of three jigs, Táim In Arears/Slieve Russell/An Rógaire Dubh. The Old Copperplate - first tune in a set of three reels, The Old Copperplate/The Copperplate/Rakish Paddy. Why Paddy's Not At Work Today - song featuring Dan Conroy on vocals. Rakish Paddy - third tune in a set of three reels, The Old Copperplate/The Copperplate/Rakish Paddy. My Lagan Love - song featuring Dan Conroy's vocal chords. WMV format. High speed connection recommended. Paddy's Lament - There's plenty more where that came from. Click Here to check out our setlist.